Snoring is defined as the resulting sound because of the movement of respiratory structures due to vibration. The sound ranges from soft short sounds to long drawn out snores. In most cases, the person who snores is not aware of this but his companions in the room are disturbed by his snoring. Some snorers wake up to their snoring but fall back to sleep and continue snoring. Many people resolve to stop snoring and employ many different techniques to do so. The causes of snoring are weakness in the throat which causes the throat to close up while sleeping, a gathering of fat around the throat which blocks part of the airflow, some obstruction in the nasal air passage way and a jaw that is positioned wrongly due to muscle tension. 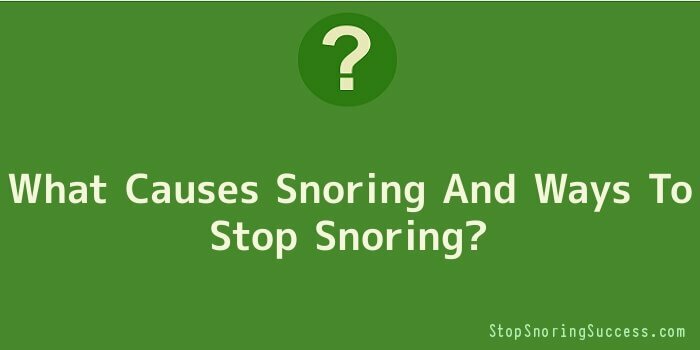 There are many suggestions and theories of ways to stop snoring. The primary focus of the many ways to stop snoring is to clear the throat and oral cavity of obstruction that can cause snoring. There are dental appliances that can help to stop or just improve the snoring of the person. Some appliances move the jaw to a better position while others move the tongue to alleviate snoring. Surgery is another alternative to effectively stop snoring. The surgical process entails the widening of the airway by removing tissues that cause blockage. In some cases, there is a risk of the airways becoming narrower if the patient has a tendency to scar and produce more tissues due the incisions. Other ways to stop snoring are just to change your usual position while sleeping or to put a nose clip to make the nostrils or nasal passages wider. These are non-surgical ways to stop snoring and many people prefer to try these initially before going for the invasive surgery. There are many ways that claim to stop snoring; these include putting a tennis ball on your back, elevating your head, not using a pillow for your head while sleeping and many others. Even losing some weight is a suggested way to stop snoring. Some of these may work for some people while others do not. It is best to bear in mind that not all techniques to stop snoring are effective for everybody. You should try the various tips to stop snoring and see which one works for you. Most like, due to the variety and creativity of the ways to ease snoring, one would fit you.